New materials from out partner The Grand Lodge of Ancient, Free and Accepted Masons of North Carolina are now online. This batch includes several Minute Books and an Account book from St. John’s Lodge no. 1, Minute books and an account book from Zion Lodge no. 81, speeches from well known North Carolina Free Masons such as William Lander and J.M. Lovejoy, letters of correspondence, and more. One item that may be of particular genealogical interest is a collection of lists of masons who died in World War I. The list is organized by name of lodge and includes the member’s rank, date and place of death, and where he was buried. 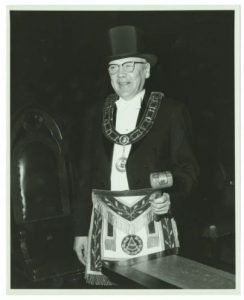 Additionally several photographs have been added including images from the 175th anniversary celebration of the Grand Lodge of North Carolina at the Raleigh Memorial Auditorium. 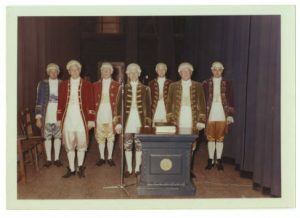 The photos show members in full regalia, as well as men in colonial costumes as part of the celebration. To learn more about The Grand Lodge of Ancient, Free and Accepted Masons of North Carolina, take a look at other digitized items on their partner page, or visit their website.